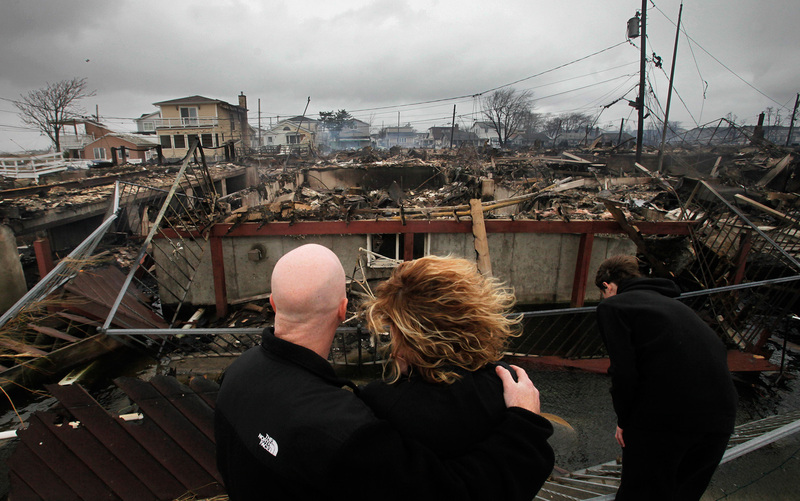 NEW YORK As superstorm Sandy marched slowly inland, millions along the East Coast awoke Tuesday without power or mass transit, with huge swaths of the nation's largest city unusually vacant and dark. New York City was among the hardest hit, with its financial heart in Lower Manhattan shuttered for a second day and seawater cascading into the still-gaping construction pit at the World Trade Center. "This will be one for the record books," said John Miksad, senior vice president for electric operations at Consolidated Edison, which had more than 684,000 customers without power in and around New York City on Tuesday morning. The storm that made landfall in New Jersey on Monday evening with 80 mph sustained winds killed at least 39 people in nine states, cut power to more than 8.2 million homes and businesses from the Carolinas to Maine, caused scares at two nuclear power plants, and stopped the presidential campaign cold. More than 18,000 flights domestic and international were cancelled. The full extent of the damage in New Jersey, where the massive storm made landfall Monday evening, was unclear. Police and fire officials - some with their own departments flooded - fanned out to rescue hundreds. Remnants of the former Category 1 hurricane were forecast to head across Pennsylvania before taking another sharp turn into western New York by Wednesday morning. Although weakening as it goes, the massive storm -- which caused wind warnings from Florida to Canada -- will continue to bring heavy rain and local flooding, said Daniel Brown, warning coordination meteorologist at the National Hurricane Center in Miami. As Hurricane Sandy closed in on the Northeast, it converged with a cold-weather system that turned it into a monstrous hybrid of rain and high wind -- and even snow in West Virginia and other mountainous areas inland. President Barack Obama declared a major disaster in New York and Long Island, making federal funding available to residents of the area. He suspended campaigning for a third day Wednesday, and planned to join Christie in viewing the damage in New Jersey. Mr. Obama, speaking during a stop Tuesday at Red Cross headquarters, warned the public that the massive storm that struck the East Coast "is not yet over." He said there were still risks of flooding and downed power lines. He called the storm "heartbreaking for the nation." The president offered his thoughts and prayers to those affected and told them "America is with you." He said he also told government officials coordinating the response that there was "no excuse for inaction." And he said he told governors in affected areas that if they get no for an answer, "they can call me personally at the White House." Republican challenger Mitt Romney resumed his campaign, but with plans to turn a political rally in Ohio into a "storm relief event." An unprecedented 13-foot storm surge of seawater -- three feet above the previous record -- gushed into the harbor, flooding city streets and subway stations. The Brooklyn-Battery and Queens Midtown Tunnels were flooded. Metropolitan Transportation Authority Chairman Joseph Lhota, said the damage to the subway system's was the worst in its 108-year history. The system remained shut down Tuesday as transit officials begin the process of pumping corrosive salt water out of tunnels in lower Manhattan and parts of Queens that were inundated. The pumping, MTA officials told CBS Station WCBS, could take up to four days. An explosion at a Con Edison substation Monday night knocked out power to about 310,000 customers in lower Manhattan, creating an eerie darkness in the city as floodwaters churned in city streets. A hospital was forced to evacuate patients when a back-up generator failed. In Queens, nearly 200 firefighters tried to contain an enormous blaze that consumed more than 80 homes in the Breezy Point neighborhood. They had to use a boat to make rescues and climbed an awning to reach about 25 trapped people, fire officials said. Hurricane-force winds partially collapsed a crane hoisted 74 stories above Midtown, which remained perilously swaying on Tuesday morning. Plans were made to stabilize the structure once the winds died down. Trading at the New York Stock Exchange was canceled again Tuesday -- the first time the exchange suspended operations for two consecutive days due to weather since an 1888 blizzard struck the city - but the NYSE will reopen on Wednesday. Hours after landfall, the storm's effects were still being felt acutely in New Jersey, where downed trees and flooding knocked out power to more than 2.5 million utility customers. Just before Sandy made landfall at 8 p.m. near Atlantic City, N.J., forecasters stripped the storm of hurricane status -- but the distinction was purely technical, based on its shape and internal temperature. It still packed hurricane-force winds, and forecasters were careful to say it was still dangerous to the tens of millions in its path. The storm caused massive flooding along New Jersey's shoreline, cutting off Atlantic City and other barrier island communities and washing away part of the resort town's historic boardwalk. Many residents who stayed put rather than evacuating were stranded. New Jersey Gov. Chris Christie -- whose own family had to move to the executive mansion after his home in Mendham, far from the storm's center, lost power -- criticized the mayor of Atlantic City for opening shelters there instead of forcing people out. In North Jersey, hundreds of people were forced to flee their homes after the entire town of Moonachie, located about 10 miles northwest of Manhattan, was flooded. Local authorities initially reported a levee had broken, but Gov. Chris Christie said a berm overflowed. Police Sgt. Tom Schmidt said within 45 minutes streets were underwater and impassable. Floodwaters also knocked out the police and fire departments, forcing them to relocate command centers to a neighboring community. By Tuesday morning the entire length of the Garden State Parkway has reopened - though Gov. Christie tweeted that motorists shouldn't drive unless absolutely necessary because 200 other state roads remain closed. As it converged with other storm systems and made landfall Monday, Sandy - which killed 69 people in the Caribbean before making its way up the Eastern Seaboard - has been blamed for at least 39 deaths, including 17 in New York, five each in Pennsylvania and New Jersey, three each in Connecticut and Maryland, two each in Virginia, Ohio and North Carolina, and one each New Hampshire and West Virginia. Three of the victims were children, one just 8 years old. The massive weather system reached well into the Midwest: Chicago officials warned residents to stay away from the Lake Michigan shore as the city prepares for winds of up to 60 mph and waves exceeding 24 feet well into Wednesday. Hundreds of miles from the storm's center, gusts topping 60 mph prompted officials to close the port of Portland, Maine, and scaring away several cruise ships. A state of emergency in New Hampshire prompted Vice President Joe Biden to cancel a rally in Keene and Republican nominee Mitt Romney's wife, Ann, to call off her bus tour through the Granite State. According to the flight-tracking service FlightAware, Superstorm Sandy grounded more than 15,000 flights across the Northeast and the globe on Monday and Tuesday. By early Tuesday morning, more than 500 flights scheduled for Wednesday also were canceled. It could be days before some passengers can get where they're going. Amtrak says most train service in the Northeast remains suspended and a decision will be made later in the day on restoring limited service north and south of New York on Wednesday. Officials declared an "unusual event" at the Oyster Creek nuclear power plant in Lacey Township, N.J., the nation's oldest, when waters searched to 6 feet above sea level during the evening. Within two hours, the situation at the reactor -- which was offline for regular maintenance -- was upgraded to an alert, the second-lowest in a four-tiered warning system. Oyster Creek provides 9 percent of the state's electricity.